As you can see, the previous owner held everything together with good old duct tape. What you can't see is the equally poor condition of the carpeting and interior trim. Before attempting to redo your seats, call Victoria British (800-255-0088) and order their "How-To Install Your Triumph TR6 Interior" guide. It's free and it's indispensable. Step by step color photographs covering every aspect of redoing the interior. It's especially important with the seats because there's nothing intuitive about how they go back together. There's all kinds of slits that need to be cut into the foam and flaps that get stuffed into the slits while other flaps wrap around things and get clipped in place. Didn't the British every hear about zippers! The next step is to clean up the frame and paint it. One down and one to go. All in all, it went pretty well and came out just about perfect. As noted before, the Victoria British instruction booklet is invaluable though I had to laugh at how easy they make some of it sound. On the side skirts of the top cover, there's a cardboard insert with a metal bracket that goes over another metal bracket on the seat frame. When properly in place, it stretches the cover down and gives it its shape. The booklet says "by pulling the sides of the cover down, the clips will eventually (key word here) slot into the corresponding bracket in the frame.......". Well, I pulled, I tugged, I swore and there was no way these two brackets would ever mate! 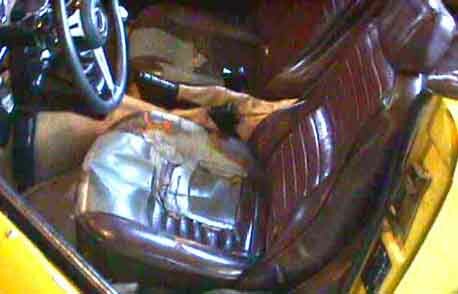 I finally laid the seat on its side on the floor, bracing it against a wall while I put my feet on the bottom of the seat frame, grabbed the side skirt and pulled until the veins popped out of my 50 year old head. I wouldn't exactly call it mating (never had that much trouble getting the corresponding pieces to slide into place when really mating!! ), but everything eventually came together. Now it's time to do seat #2.